Yet here we are in a fractious and complicated world, trying to keep our heads up and our eyes open. I struggle finding the balance between remaining informed and drowning in the daily assault of depressing, maddening and unwelcome news. Over the past few weeks I’ve been mentally planning a miniature peace garden. While it’s true that merely being in the garden is peaceful and uplifting, I wanted something more. I craved a touchstone for my own inner peace. 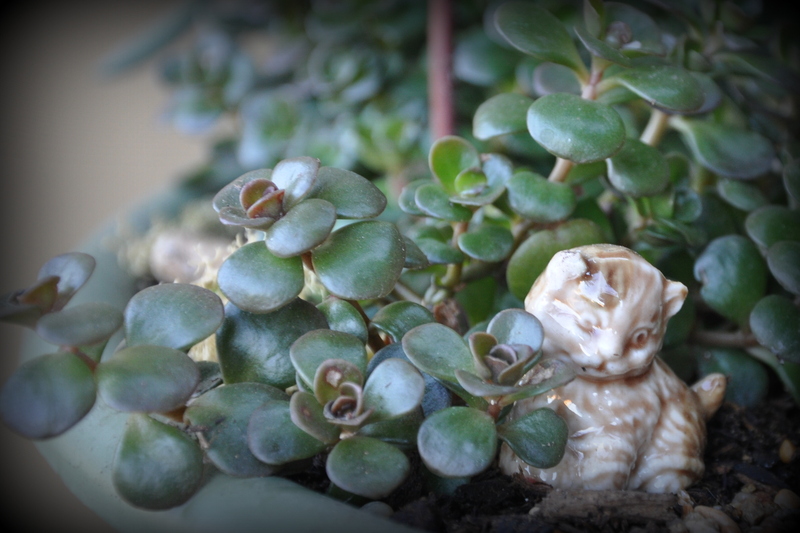 I started with a miniature Buddha, long a symbol of peace and enlightenment. 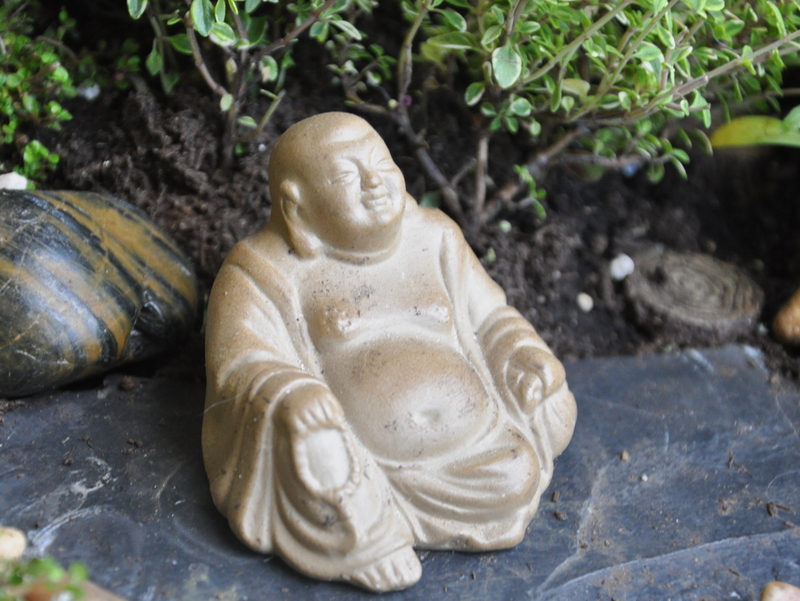 I discovered my Buddha on a website dedicated to gardening in miniature. 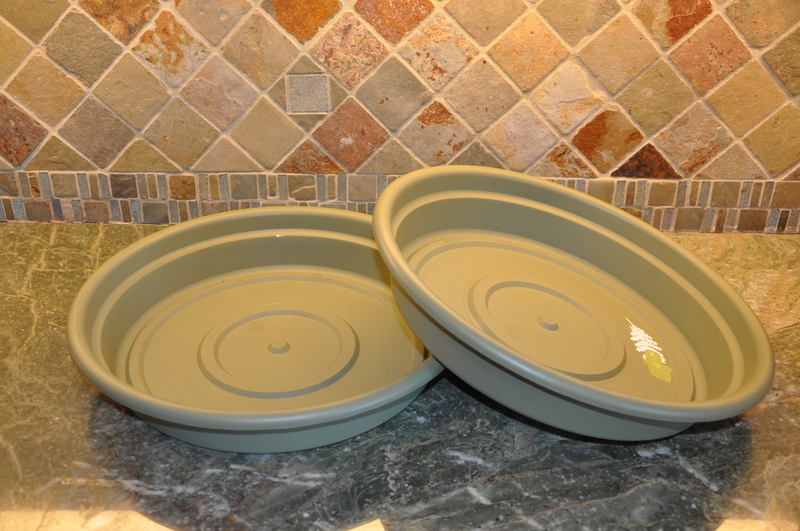 I bought a pair of shallow, glazed pots in a soothing green at a local shop. 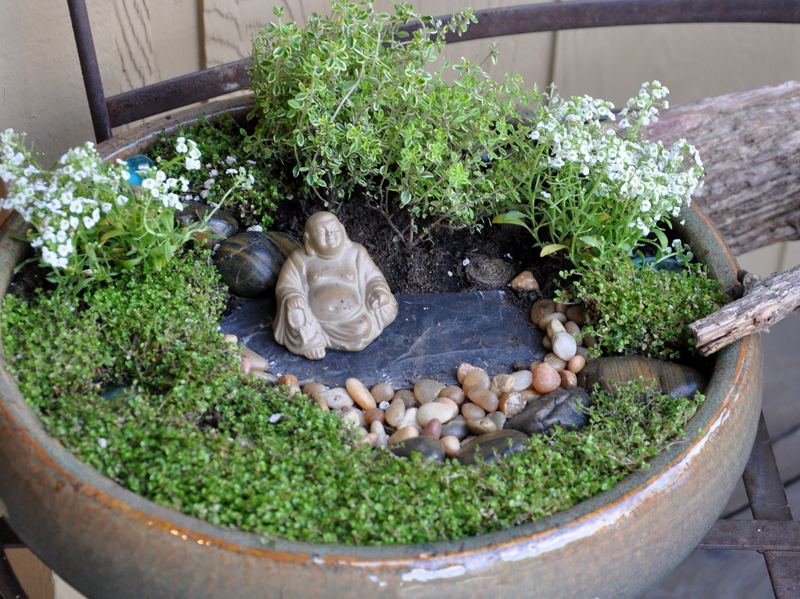 Buddha sits under a tree of Lemon Thyme, with Alyssum on each side. I carpeted the rest of the garden in cool Soleirolia soleirolii also known as baby tears. 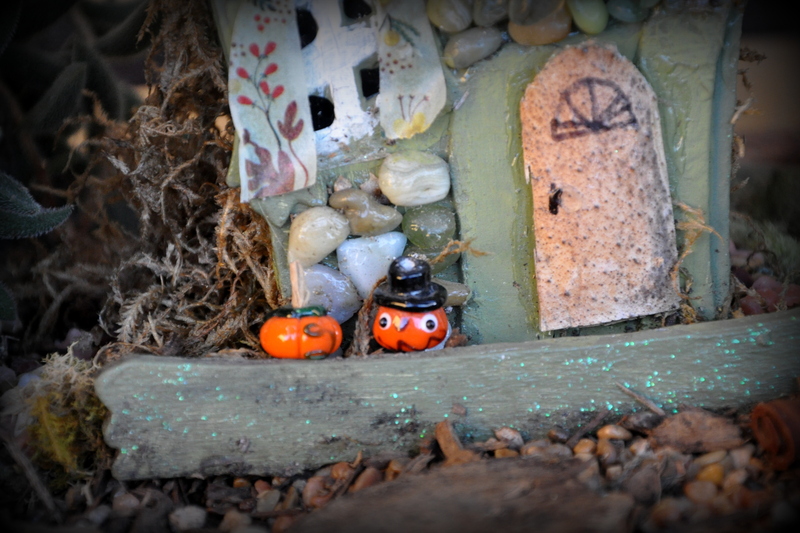 Other than the boulder-sized stones, the rest of the items came from my fairy garden stash. The cool colors and the lovely honey-scented Alyssum are a balm to the nerves. 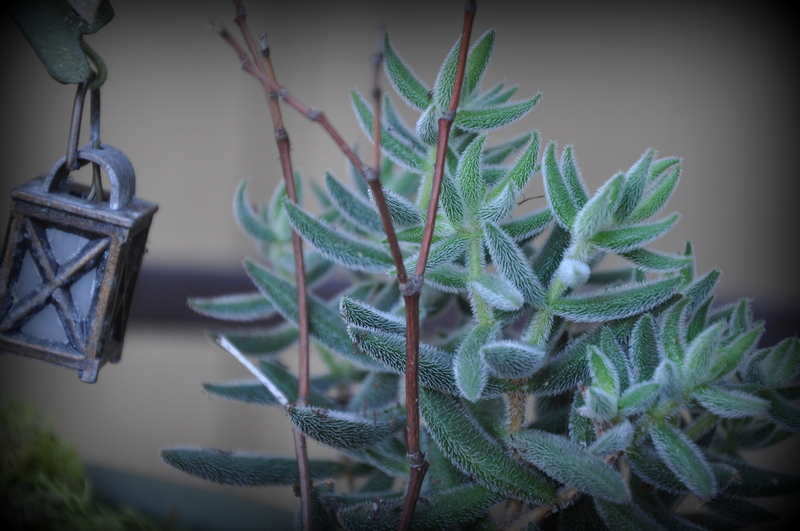 As the summer wears on, the Alyssum will fall softly over the edge of the pot. Across the log bridge you’ll find a small bench at the top of a path, and a few blue glass stones to suggest water. 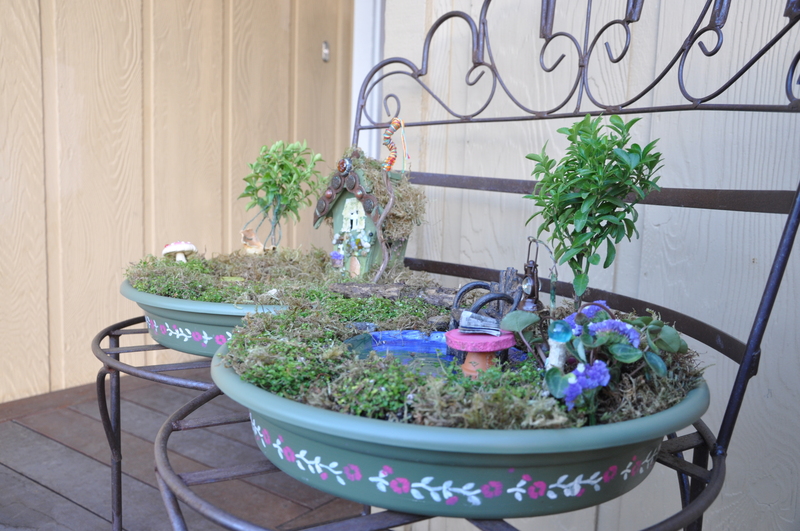 A simpler version of the fairy garden, reduced by half, sits on the wall along the walkway. Our Little Free Library is undergoing some renovations, so the books are temporarily in a purple bin. This small garden brings me moments of peace. I hope visitors will gather a moment’s peace as well during these trying times. I’m sending hope and light and love out into the world. Without them I’d be lost. 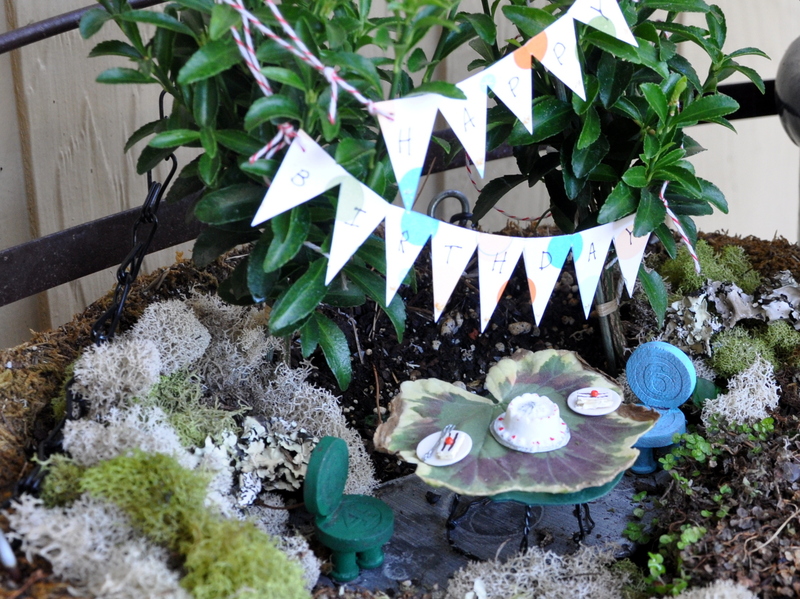 I’ve said it before: creating a fairy garden is a shortcut to our inner child. That’s why I jumped at the chance to make one for Elizabeth. Elizabeth Cassidy is my Pilates instructor. I’ve been taking classes at her studio for nearly a decade. We’re a close-knit group of women, who regularly offer bounty from our gardens, clothes or shoes in search of a new home, references and referrals and the like. 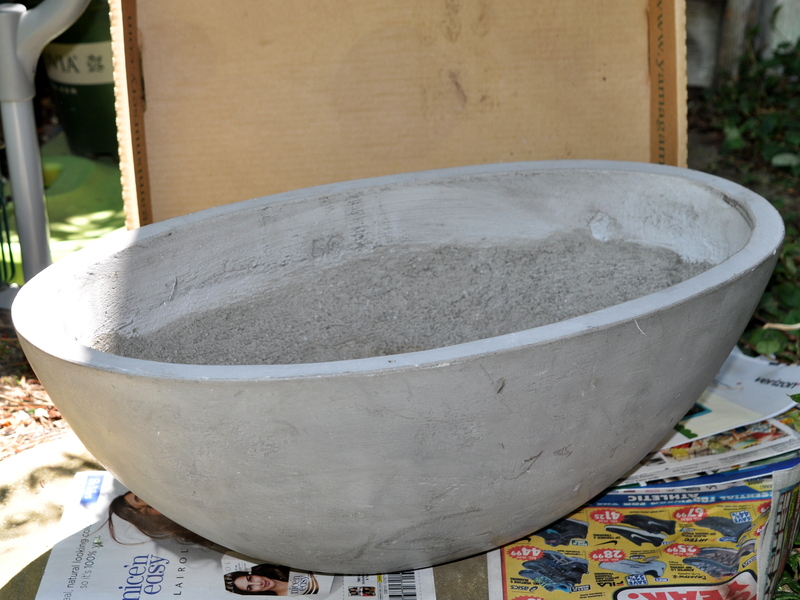 At the end of class one day, she asked if any of us wanted this empty concrete planter. 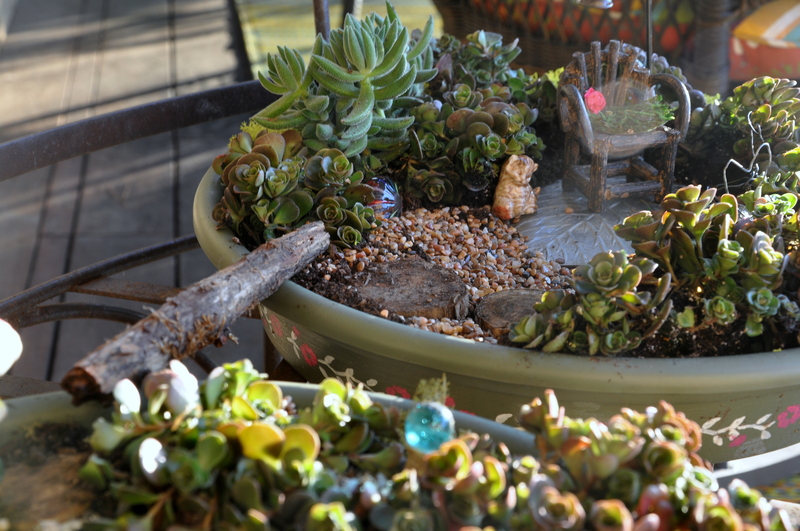 Since no one else wanted it, I offered to make it into a fairy garden for her studio. Oh my gosh I had fun! 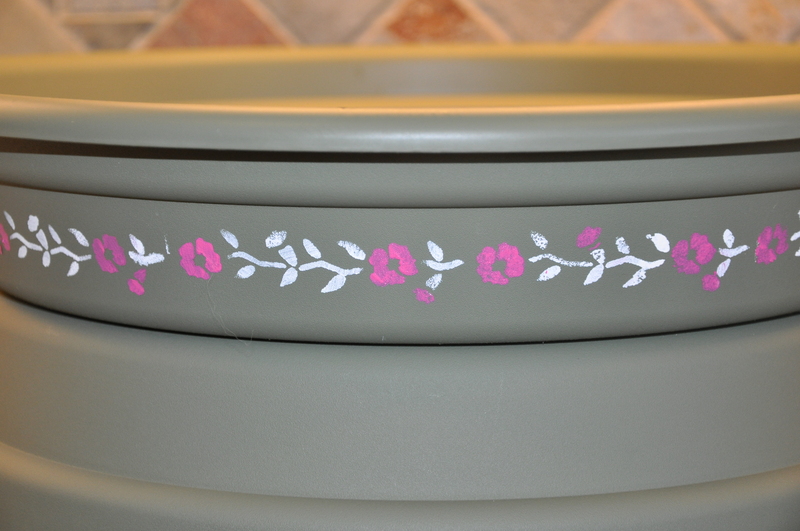 I wanted to bring a bit of warmth to the grey pot, so I added a single coat of rust-colored spray paint along the top, bottom and sides. 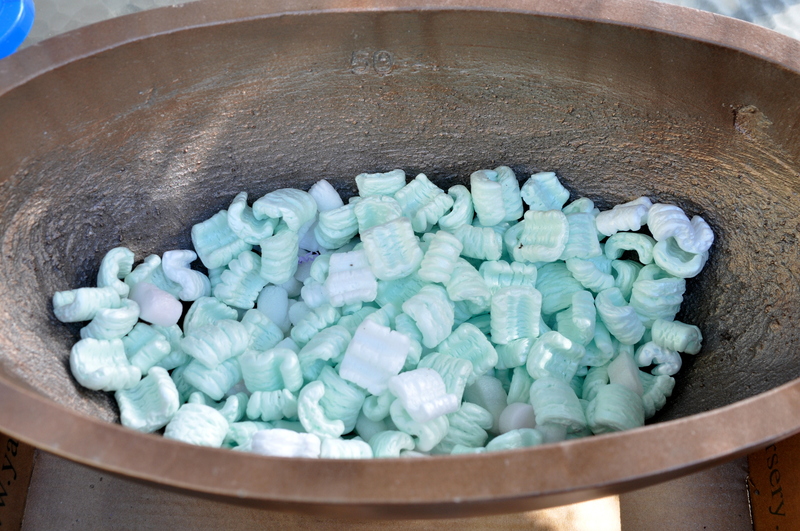 I added recycled packing pellets to the bottom of the pot to reduce its weight and to provide drainage. Then I filled it to the top with plants and soil. 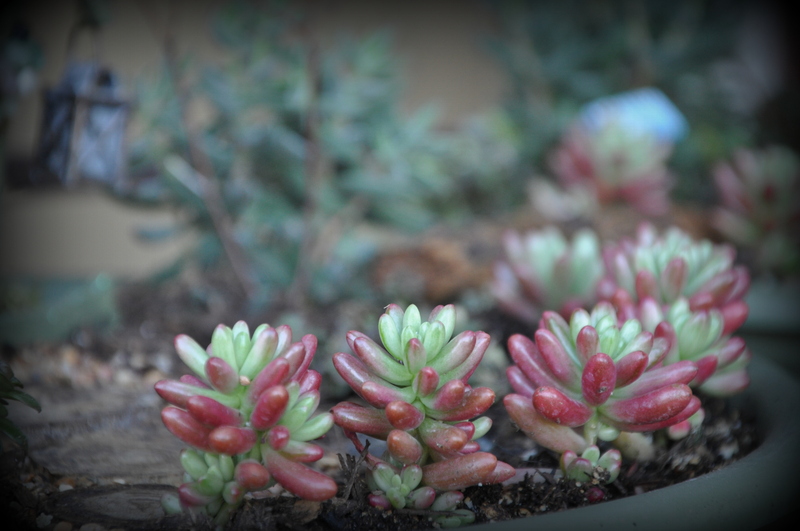 I bought assorted succulents at Yamagami’s Nursery one of my favorite garden centers. They’ve been in business since 1948. 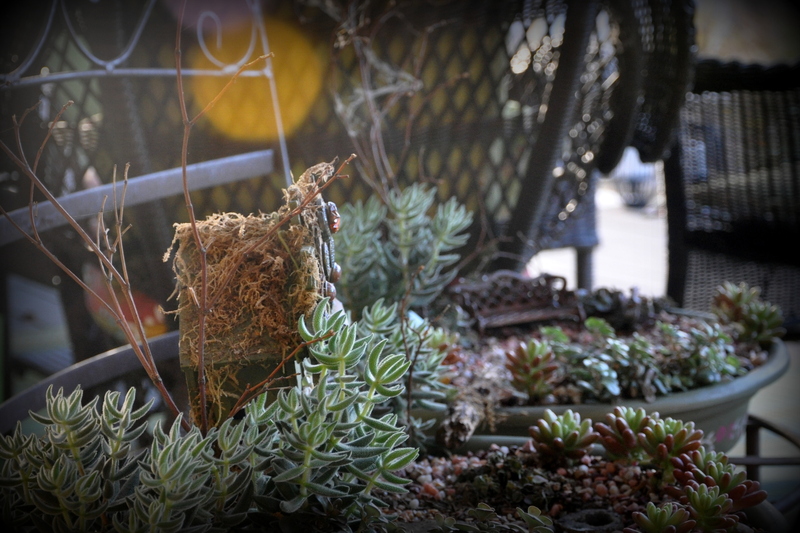 Elizabeth has a pink corner in her studio, so the “fire-stick” succulents were the perfect addition. 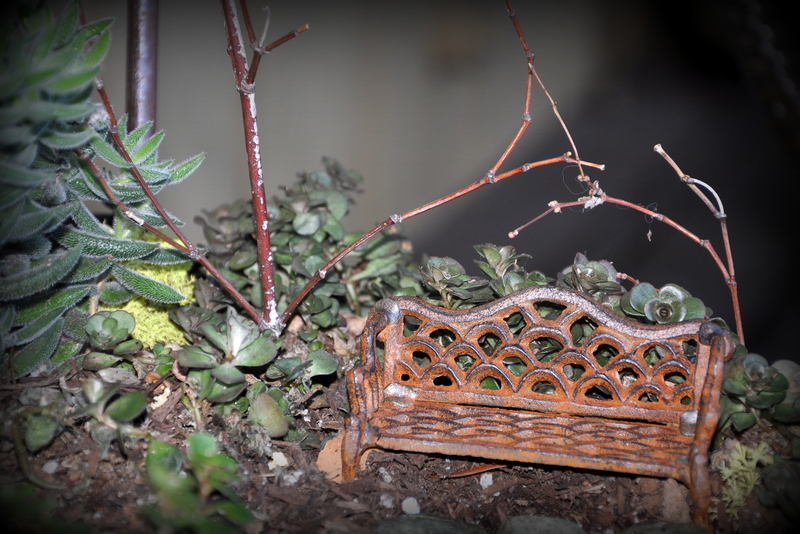 I found the sweetest little ceramic house and copper fence, also at Yamagami’s to round out the garden. I made a fairy cot or lounging bed using a small wooden block from a rubber stamp collection. 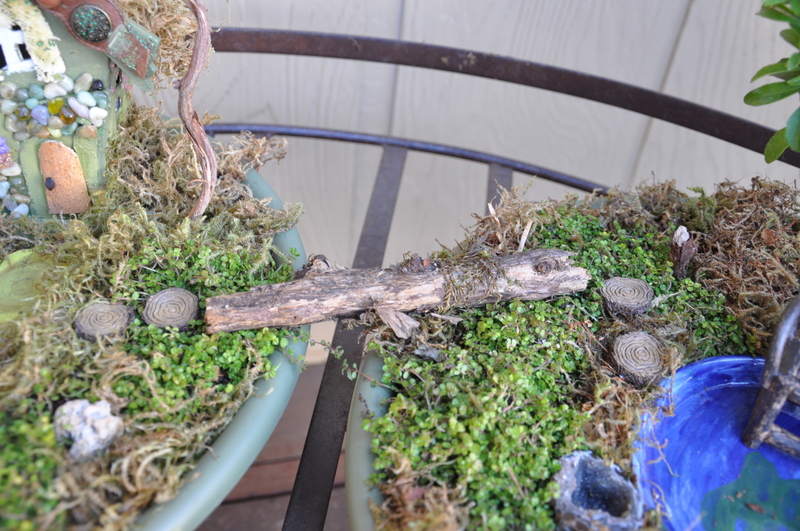 I added a curved twig for a headboard, covered the bed with moss, and added a wine cork for a pillow. A bit of moss from my garden stash made a nice accent cushion. 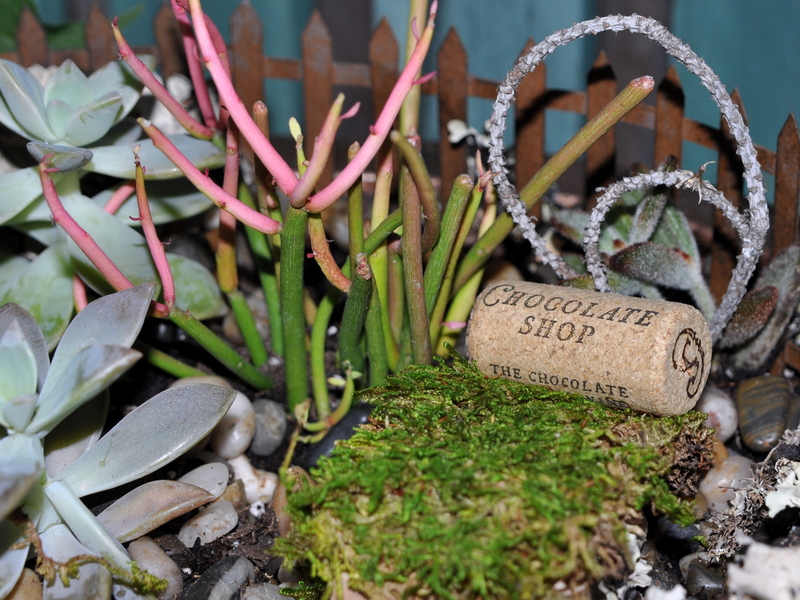 For an added bit of serendipity, the chocolate wine cork is from a gift Elizabeth gave me a few years ago. 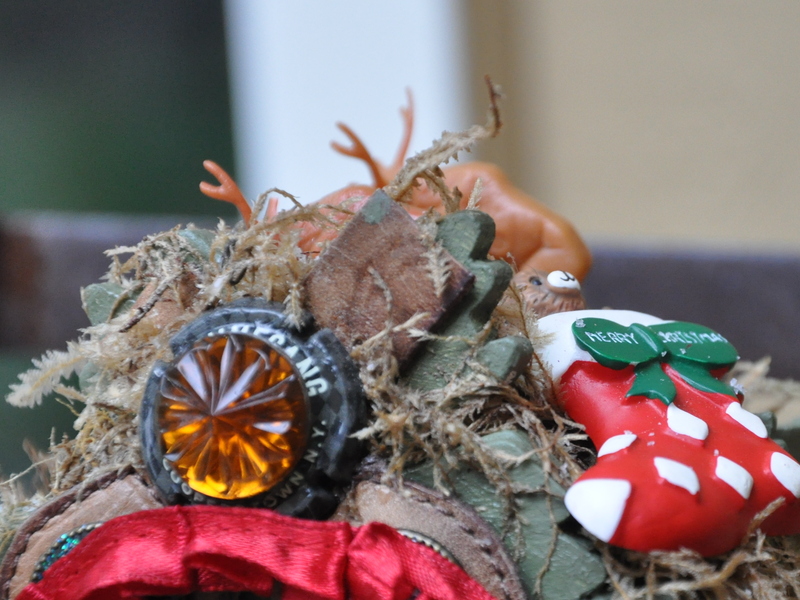 It was in my fairy garden stash, waiting for its debut. Once the plants were in the “ground” I laid a cinnamon stick path to the door, then added gravel and other bits of moss here and there. There is good news on the wildfire front! The Loma Fire I mentioned in An Ominous Autumn Beginning should be fully contained by today. According to the San Jose Mercury News, the 2-week-old wildfire remains 95 percent contained after burning 4,474 acres, destroying 12 homes and 16 outbuildings, and damaging but not destroying one other home. The blaze, which began Sept. 26, is the area’s third largest in the past 15 years, and the latest damage estimate is $15 million. The Soberanes Fire, mentioned in my post August Doldrums, is 99 percent contained, with full containment expected by Saturday, October 15. The fire started July 22nd from an illegal, unattended campfire. It’s burned 132,127 acres, and destroyed 57 homes and 11 outbuildings. A total of 682 personnel and nine engines remain fighting the fire. The cost of fighting the fire is currently $236 million, making it the most expensive fire in California history. Needless to say, I’m glad our rainy season is on the way. 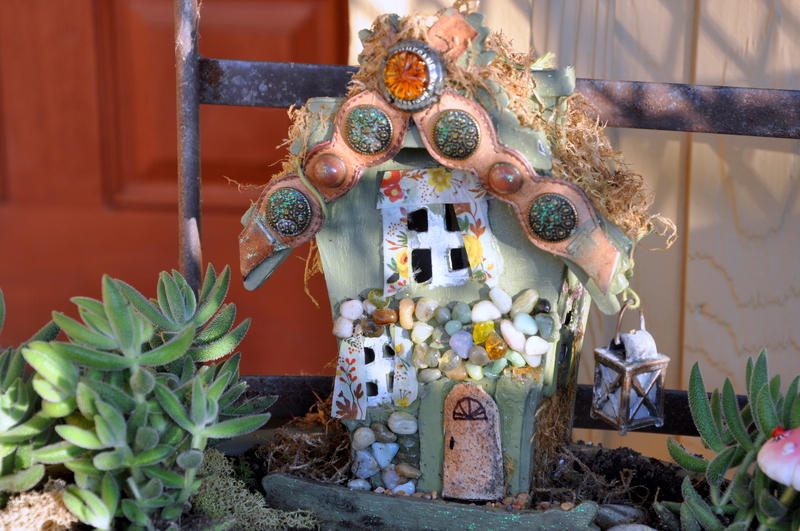 If you’ve been on the fence about starting a fairy garden, read on. By the end of my top ten, I hope you’re ready to let your creative juices take flight. 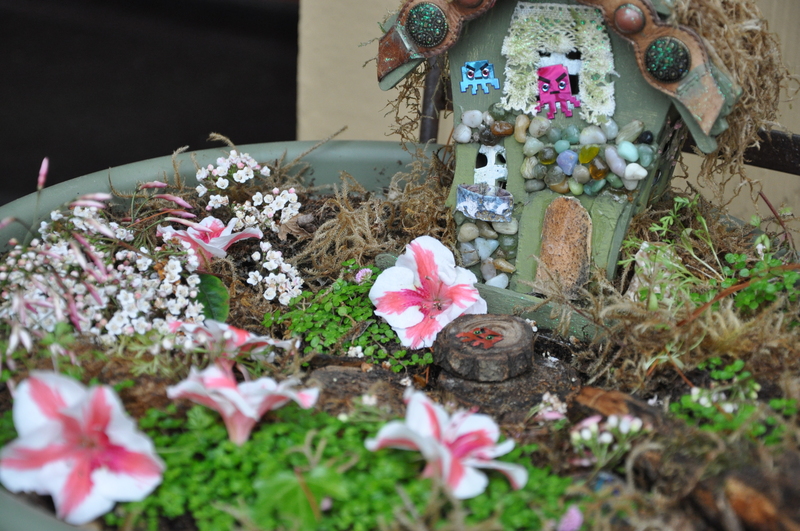 Fairy gardens are a short cut to our inner child. Not the cranky, I-don’t-want-to-take-a-bath-and-go-to-bed inner child but the child that loves digging in the dirt with a spoon. Remember chasing butterflies and dandelion fluff on a warm summer day? 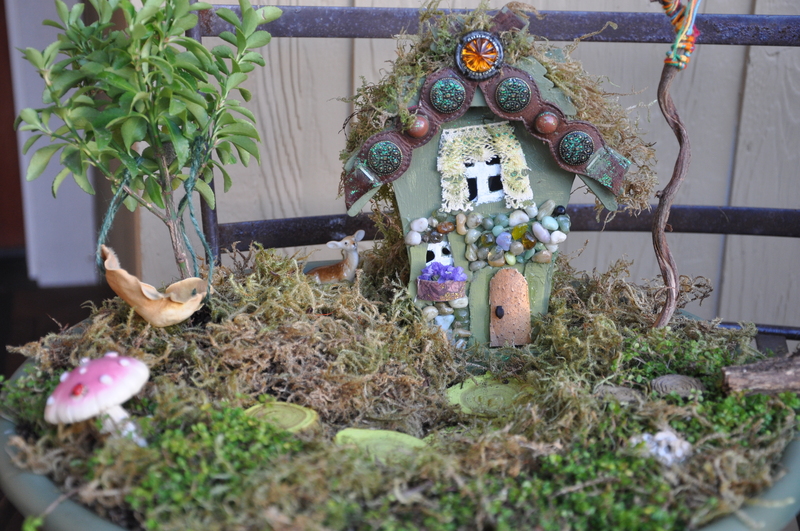 Fairy gardens are a wonderful way to express that carefree joy once again. 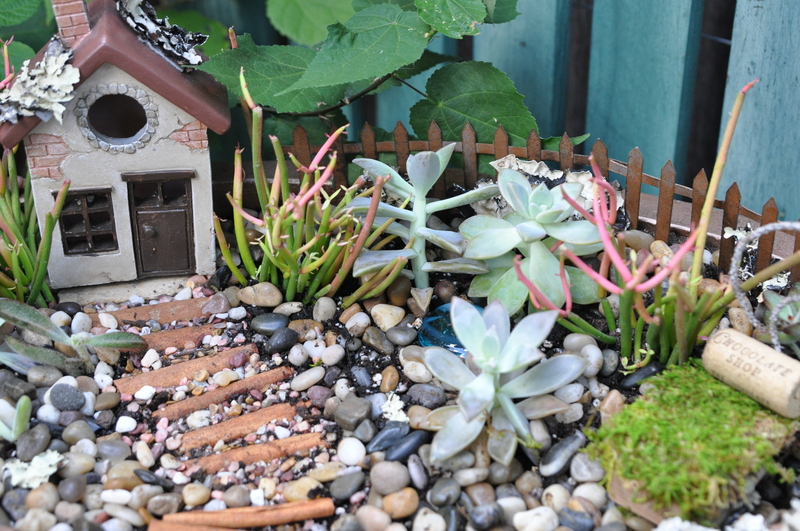 You don’t need a lot of space to grow a fairy garden. 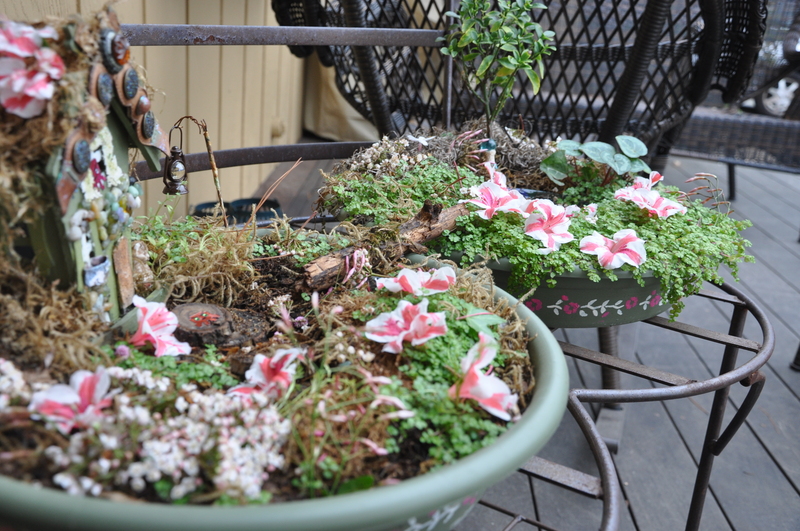 You can plant in a pot on your patio or fill an old wheelbarrow in your back yard. 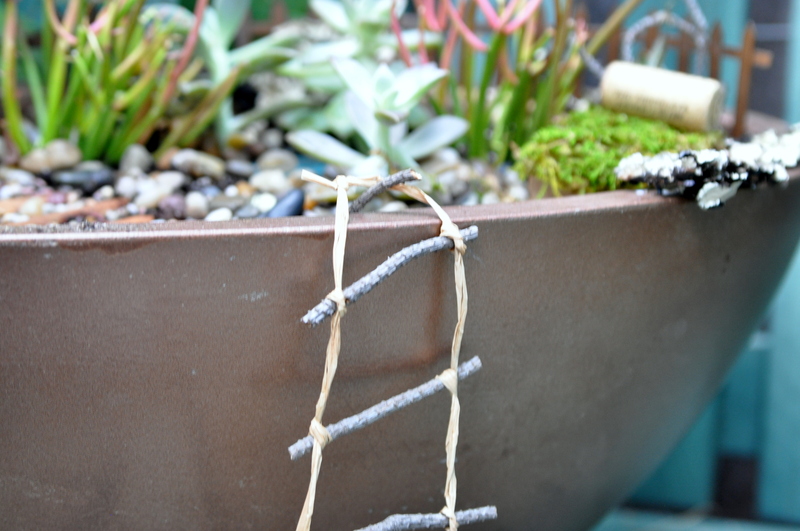 Grow your tiny garden indoors or out. Let your imagination be your guide. 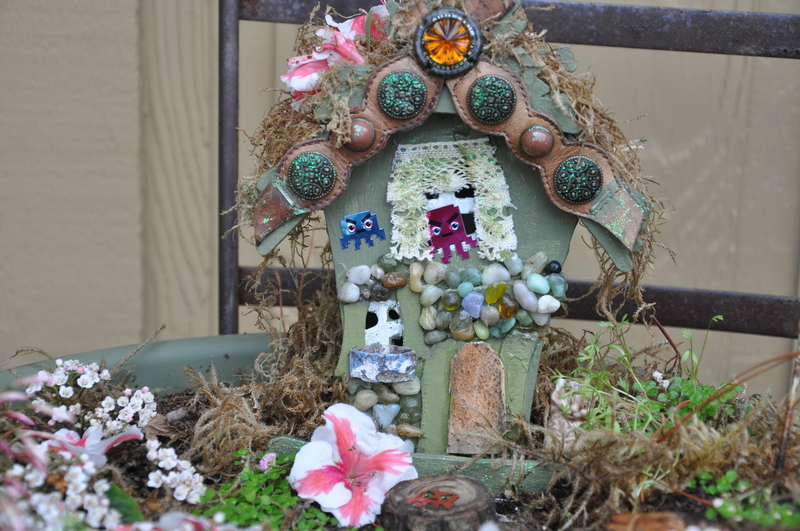 Fairy gardening is affordable…or free. You don’t need to buy a thing. 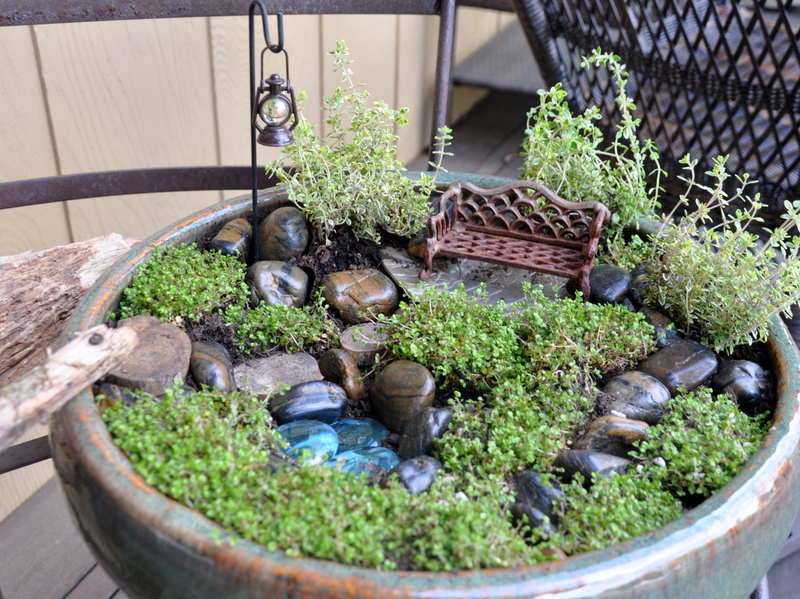 A traditional fairy garden might live under a shrub or near the forest floor. 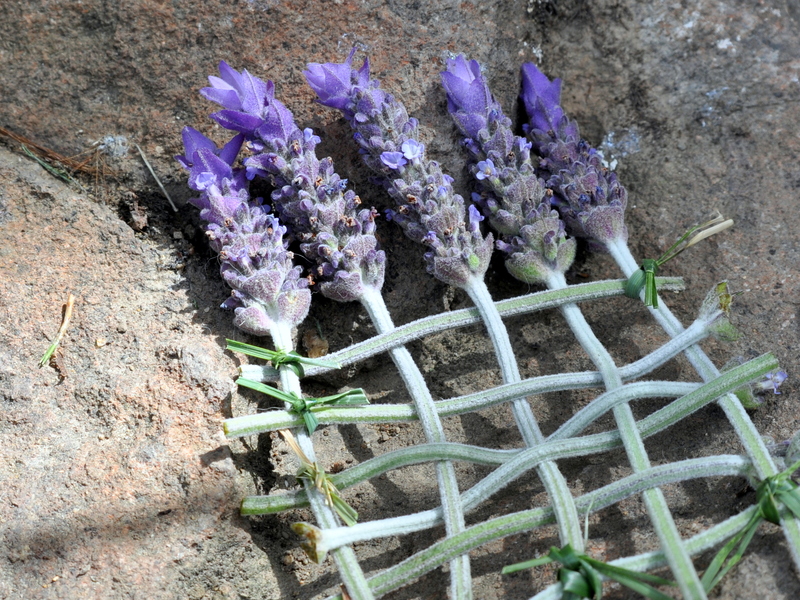 Smooth stones make wonderful seats and twigs are perfect for fences, walkways and four-poster beds. Fairies enjoy resting on the soft side of a flower petal with a blanket fashioned from a sprig of fern. Decorating on a dime. If you love decorating but have run out of money or rooms, this is the hobby for you. 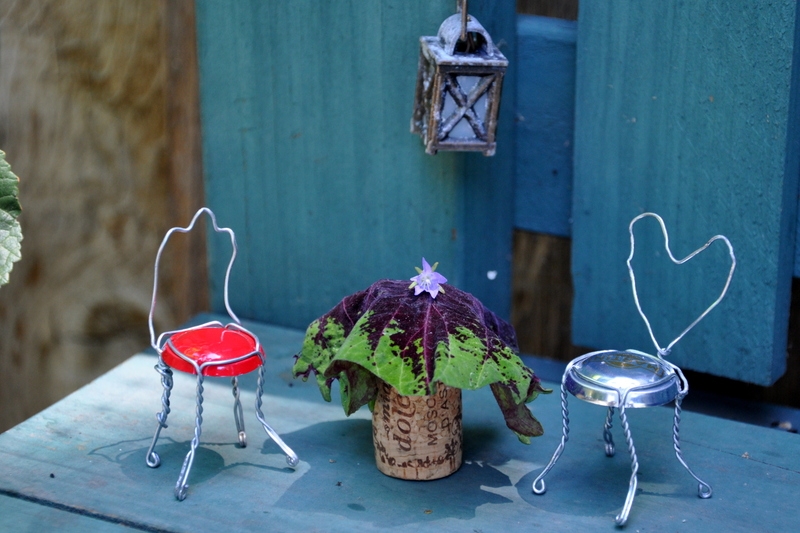 You can switch out the decor of your tiny garden as often as you like. It’s fun to put up lights for the holidays or lay down green stones for St. Patrick’s Day. The sky’s the limit, without the price tag. 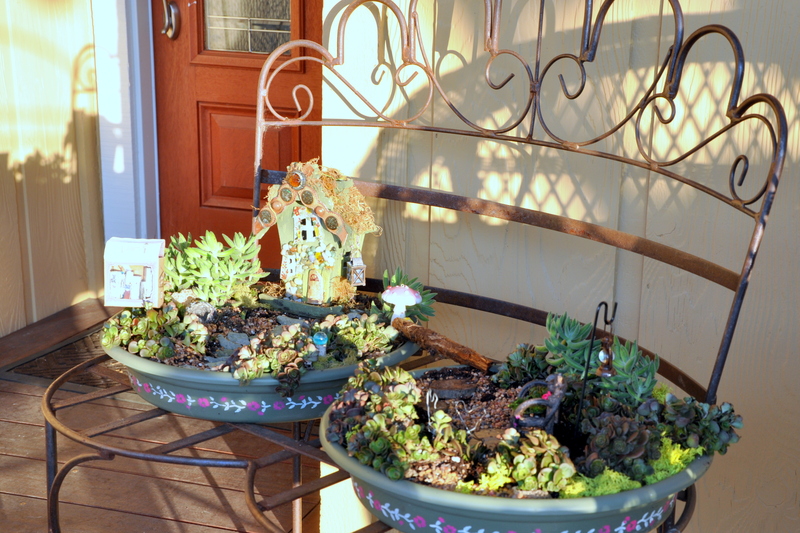 Fairy gardens are a fun way to up-cycle household items. 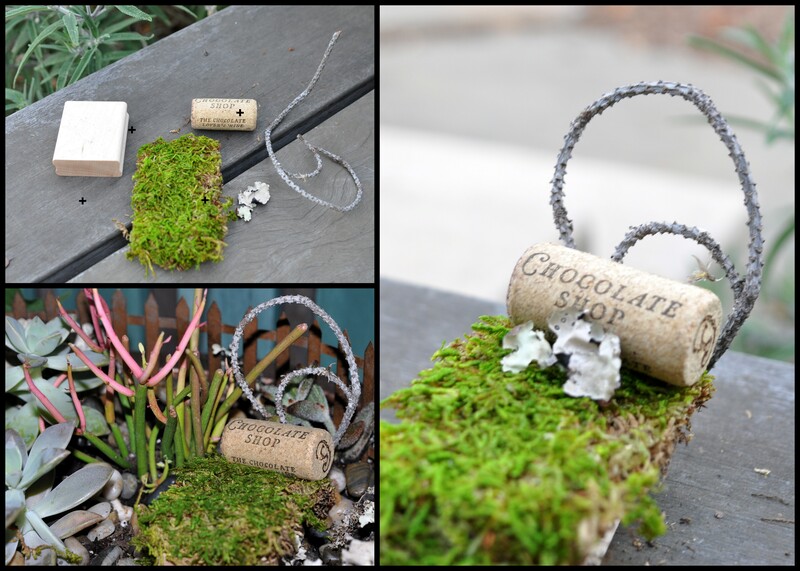 I’ve used wine corks, empty tea light holders, scraps of ribbon and the cap from a bottle of champagne, pictured above. You can use up old paint, or give a second life to a discarded toy. I love the challenge of using things I have on hand. 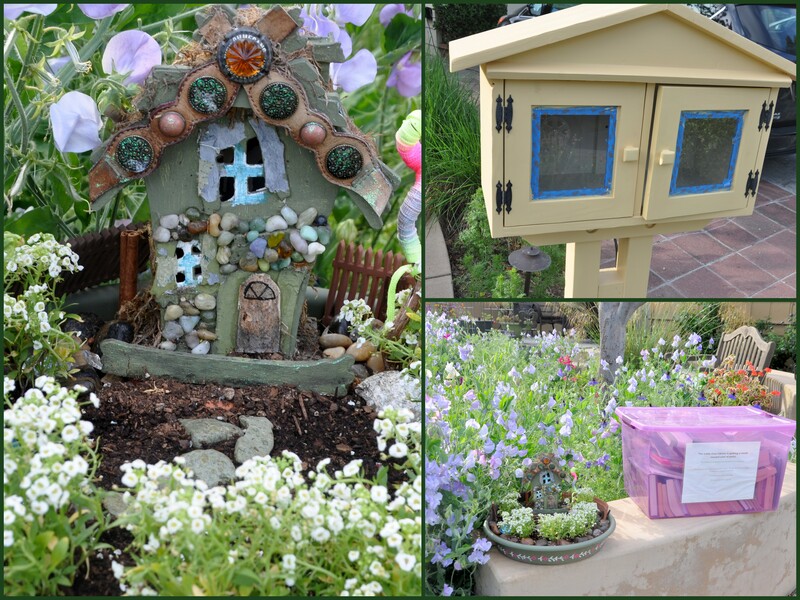 Scavenging for your fairy garden is a great way to spend time outdoors. I brought home a tiny “log” from one of my hikes and turned it into a bridge. 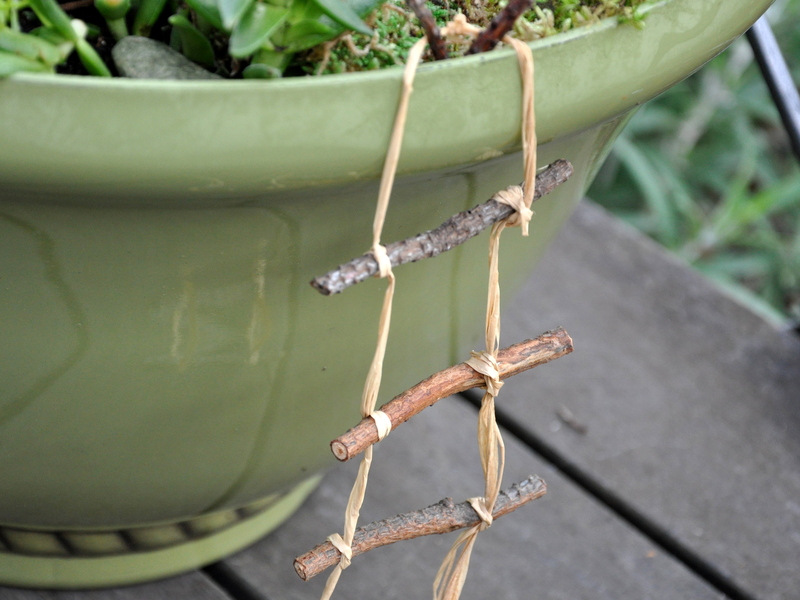 I used broken twigs from a pine tree to make a small rope ladder. One year I fashioned a hammock from the soft petal of a magnolia. Using nature’s discards is fun. At a loss for words? 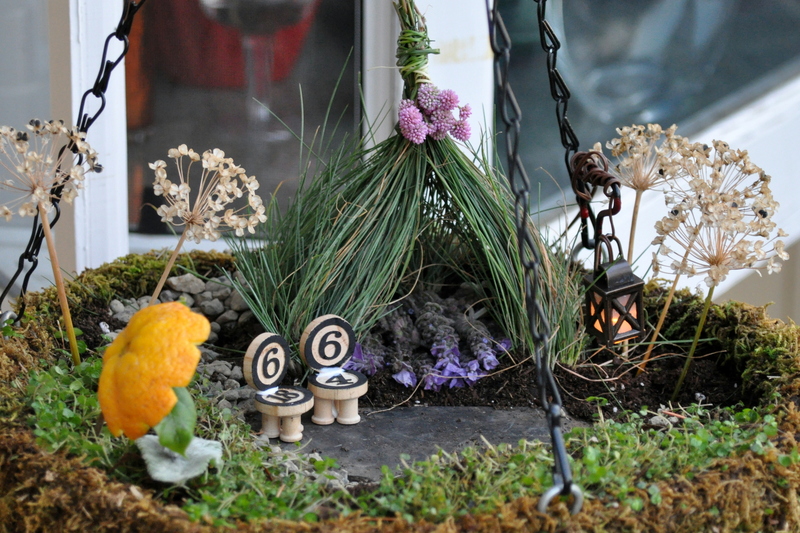 Fairy gardens are wonderful conversation starters for guests five through 105. 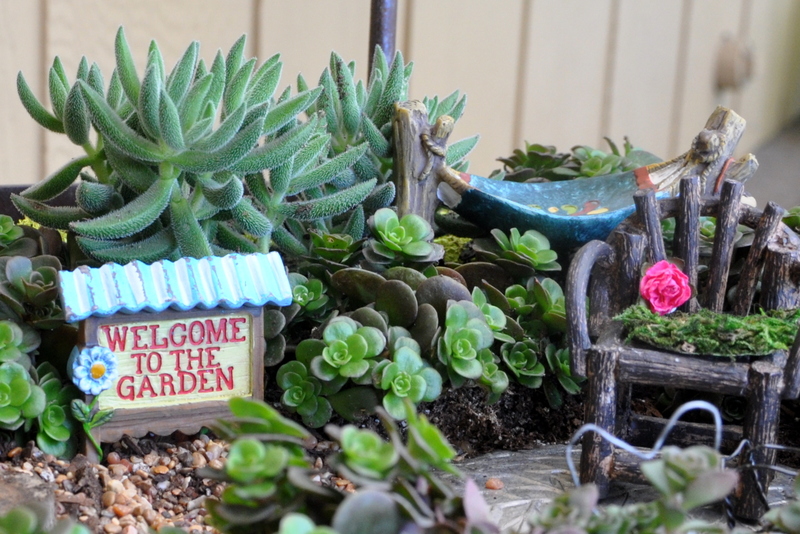 People always have questions or comments when they see my fairy garden. Chatting about fairies is a terrific icebreaker. 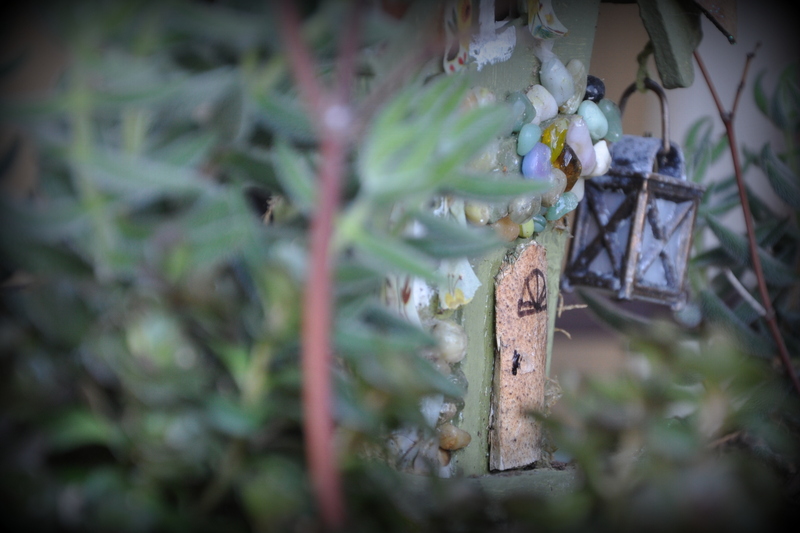 This fairy house roof line is decorated with straps from an old pair of sandals, a bottle cap and a bit of glitter. The door is cut from the tough bark of a large fern with a seed for a door handle. Fairy gardening is a unique way to express thoughts and emotions that are hard to put into words. Creative endeavors help lower stress and anxiety. 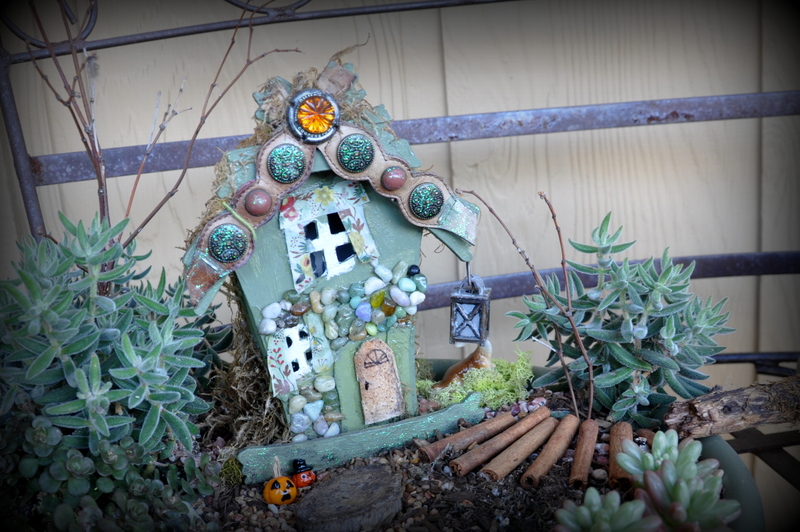 An hour in your fairy garden can help you feel calmer and happier. It allows you to create something uniquely yours which in turn can bring you a sense of pleasure. Your friends will join in the fun. A few of my friends started their own fairy garden. Several others send me wonderful little garden treasures in the mail. I’ve found a few anonymous surprises on my doorstep and even more in the garden. My neighbor’s daycare children add flowers and the odd sticker to let me know they’ve stopped by. It’s fun to be a part of this not-so-secret society of fairy lovers. 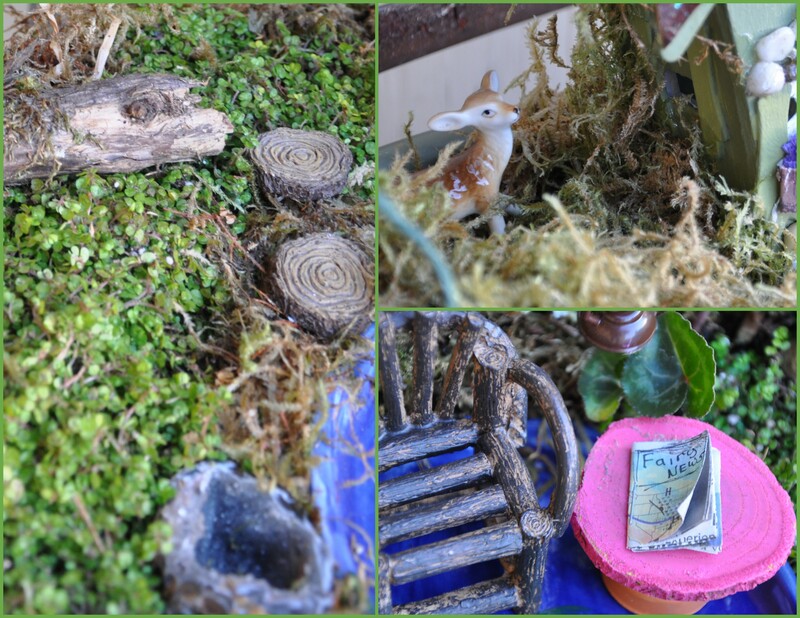 Designing and tending a fairy garden allows your imagination to soar. There are no rules, no guidelines and no restrictions. Creative endeavors relax the mind and feed the soul. 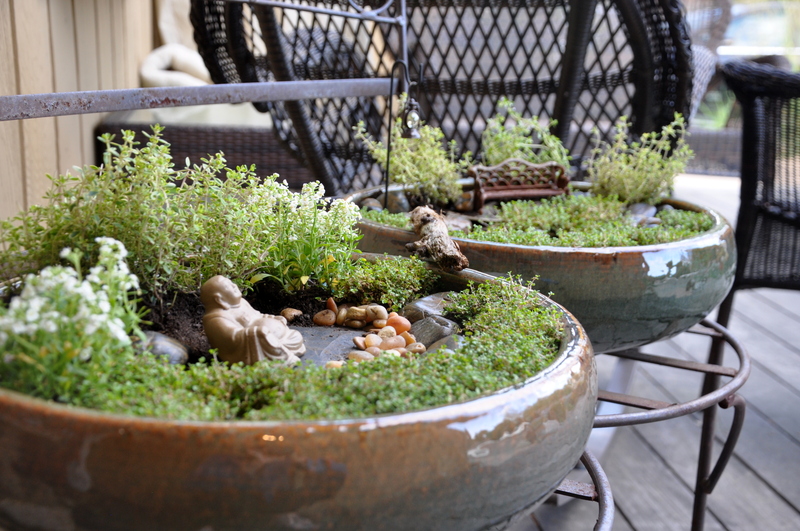 Even the busiest among us can carve out time to tend to a wee garden. 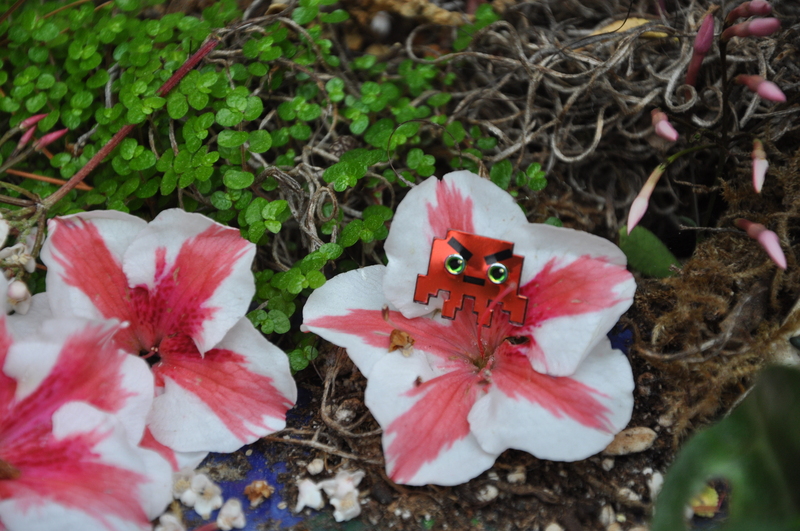 In exchange, the tiny garden will tend you. 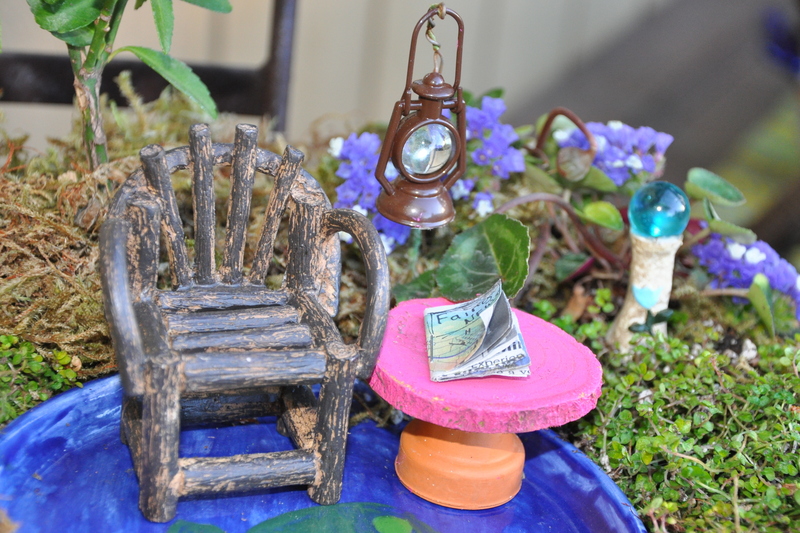 Stay tuned for my latest fairy garden creation: time at the lake. We’re over here. Please come join us. And as the seasons come and go, here’s something you might like to know. playing games just like you play, singing through their busy day. A rustle in the wind reminds us a fairy is near. Do you hear the rustle in the wind? Special thanks to Everything Fairyland for the wonderful compilation of quotes. 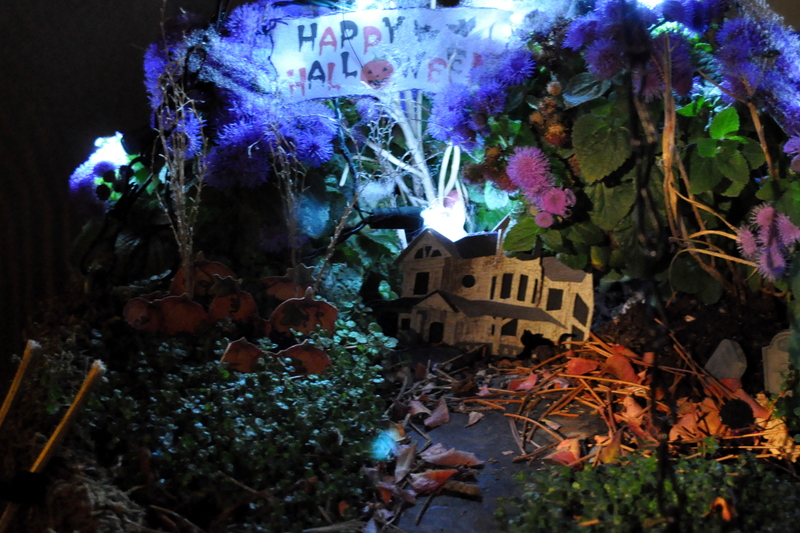 The neighborhood kids were off from school last week, and a few of them came looking for the fairy garden. 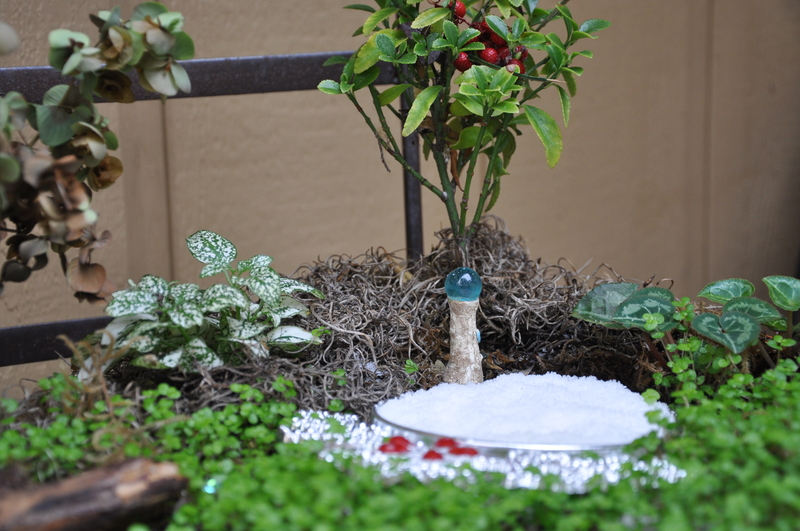 I moved my miniature garden to the back patio in December to make room for Christmas decor. I never moved it back. My son helped me carry it back to the front deck and the little ones got to work. 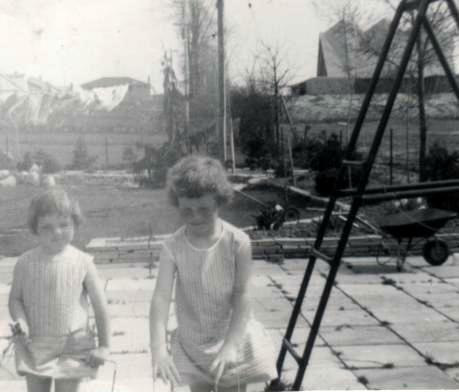 When I was six, our street ended where a field began. A nursery operated on the other side, so we enjoyed an expansive view. Across the street was a vacant lot that filled with weeds after the rain. With the freedom to roam that we had in those days, I remember gathering milk weed and clover and spending hours day dreaming while weaving creations with those glorious, green weeds. It’s been years since I thought about that field, but it may explain my love of fairy gardening. Creating in miniature carries you back in time. It’s part wanderlust and a generous helping of nostalgia, but also a connection to a simpler time, of days spent belly down in a field of greens lost in thought until my mother called me home for supper. 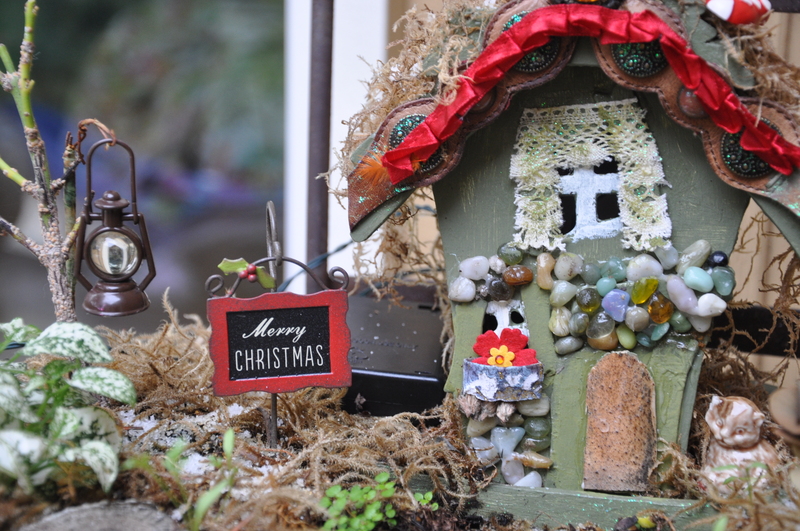 I thought I spotted Santa in the fairy garden! On closer inspection I realized it was a pair of reindeer and a bag of toys. Santa must be down at the local coffee shop, getting his fill before the big night. The reindeer lingered to see if they could spot any carrots growing in the curb garden. Sorry fellows. I’ve been a lazy winter gardener this year. 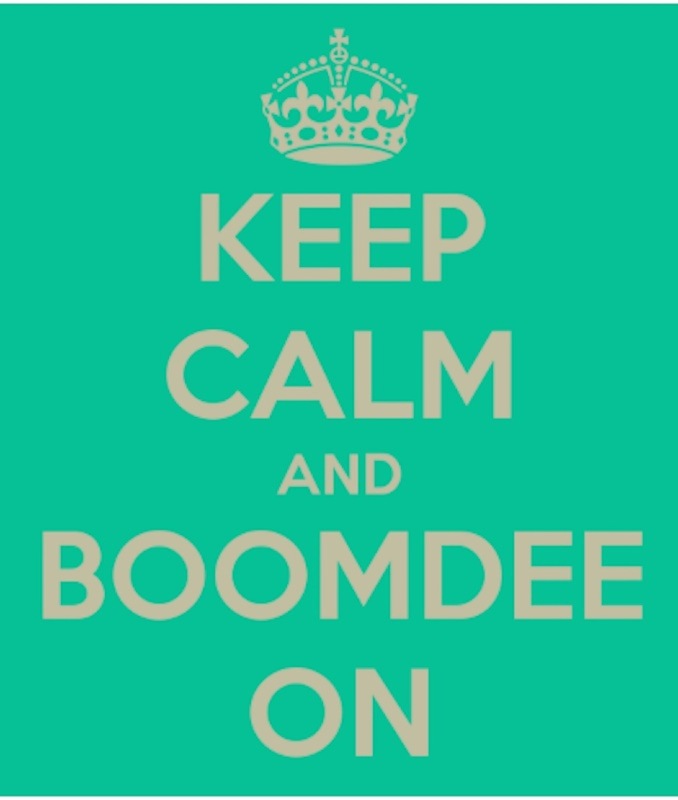 Boomdee sent this charming little Christmas sign all the way from Alberta, Canada. Isn’t it adorable? It will be welcoming the wee visitors for years to come. 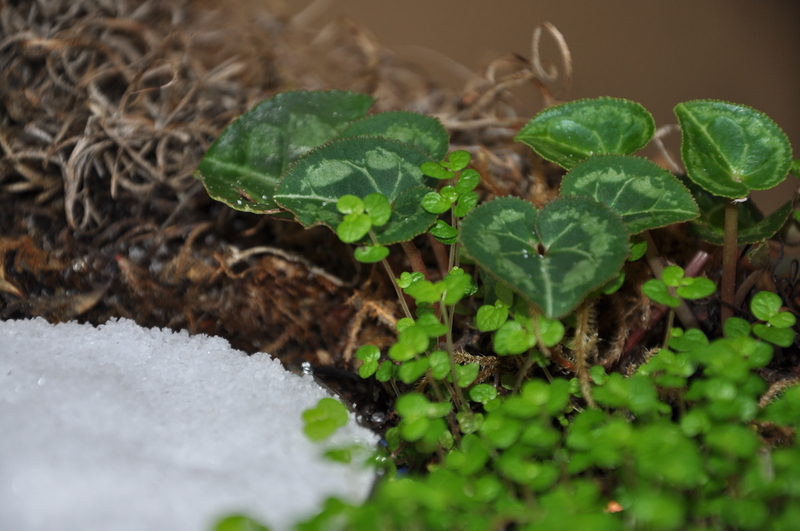 The miniature cyclamen is back in business, preferring the colder weather to our summer heat. The baby tears revived as well and are filling in nicely. 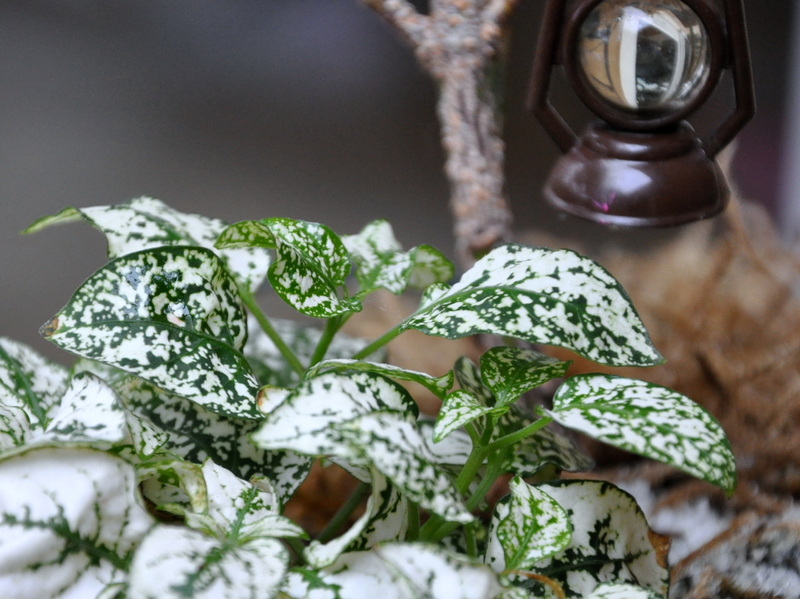 I added a pair of hypoestes also known as polka dot plants for a bit of white contrast. I’ve never seen this white variety. They’re usually pink. In case they’re looking for some exercise, I’ve added a small ice-skating rink. San Jose doesn’t get that cold, so like our local hockey team, the San Jose Sharks, we made our own ice. If I’ve timed this right, it’s still Christmas in the southern hemisphere and almost Christmas in the north. Merry Christmas! Are you familiar with the old adage, “one thing leads to another?” The classic children’s book If You Give a Mouse a Cookie uses this concept with great humour. So, if you give a friend a craft store gift card (thank you Stephanie), she’s going to want to use it. 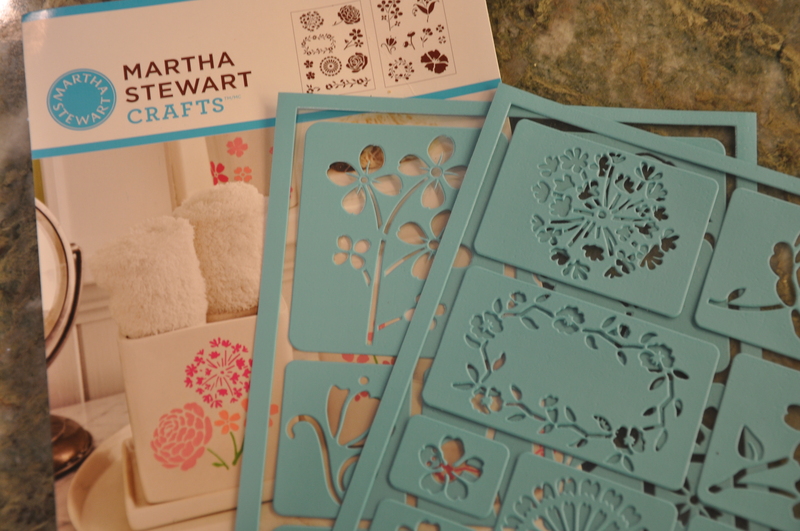 When she goes to the crafting store, she’ll discover cute little stencils. She buys those stencils along with a few acrylic paints. 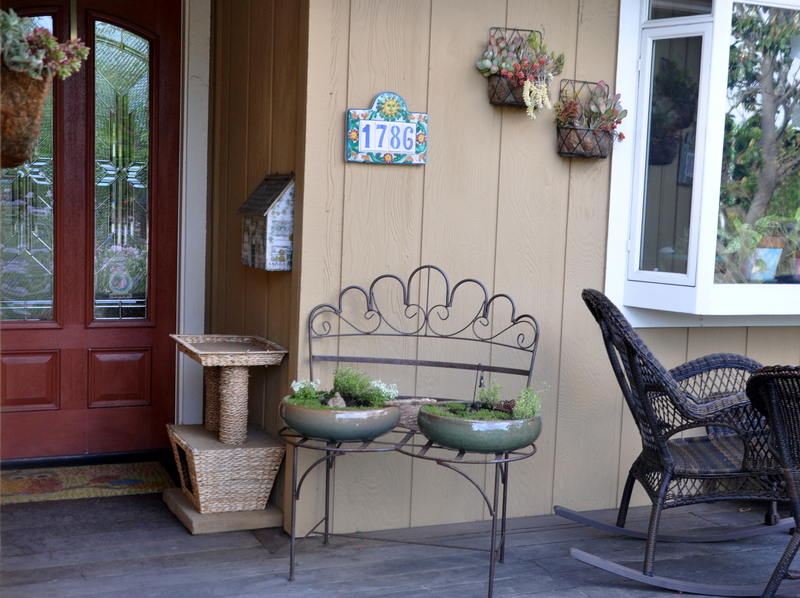 Since the garden nursery is *right next door* to the crafting store, she’ll pop in for a look. While there she’ll find the perfect, over-sized plant trays and the wheels begin to turn. 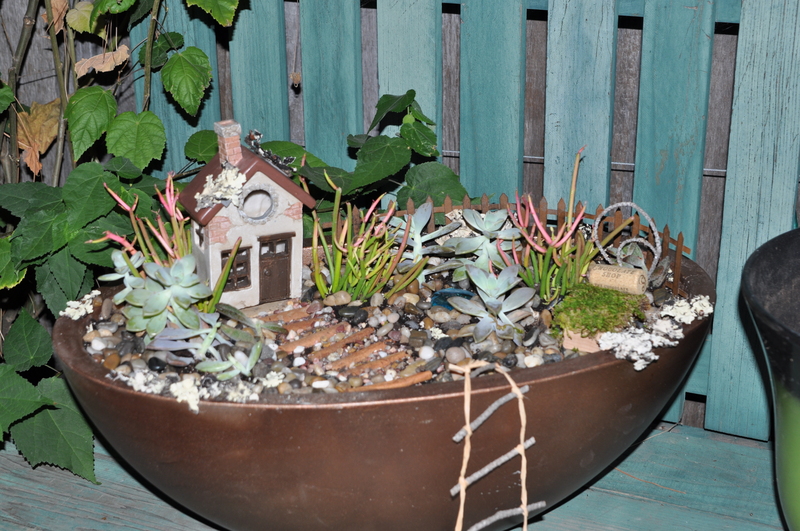 Fairy garden renovations, here I come! She’ll rush home with the loot, but days will pass before she has time to play. She moves the project from the garage workbench to the kitchen counter, thinking she’s more likely to work on it there. She’s right! Racing the clock, she stencils one of the trays before heading off for another appointment. Family memories say lovely things, spurring her on. The stenciled trays must wait to dry. 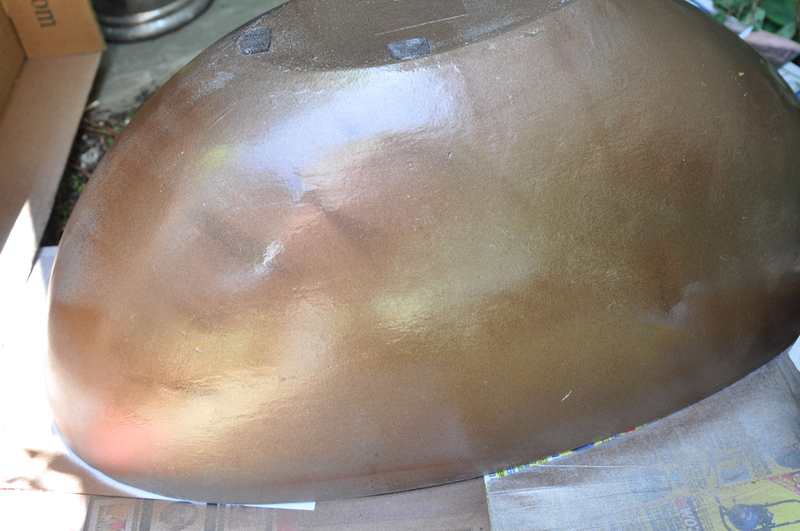 Once dry, they need a sealer. Once sealed, they need some soil. Mother’s Day rolls around and she wants nothing more than an afternoon renovating the garden. 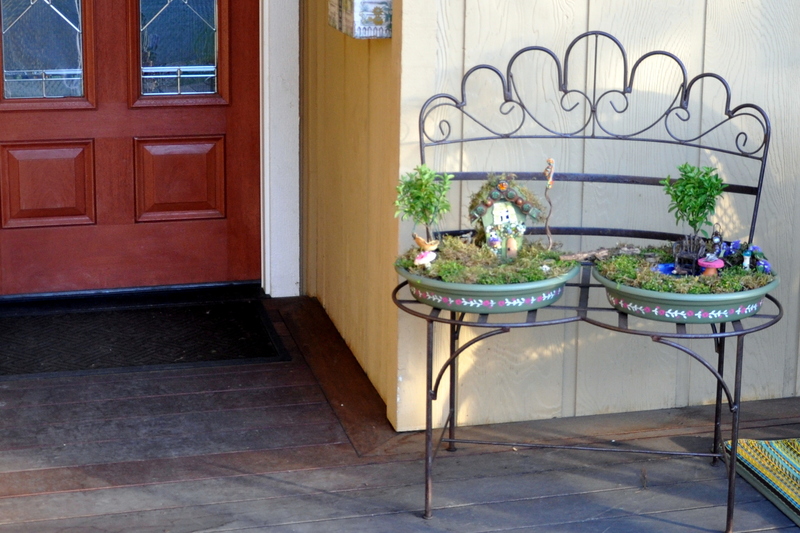 Two planter trays are the perfect size and shape for my garden bench. 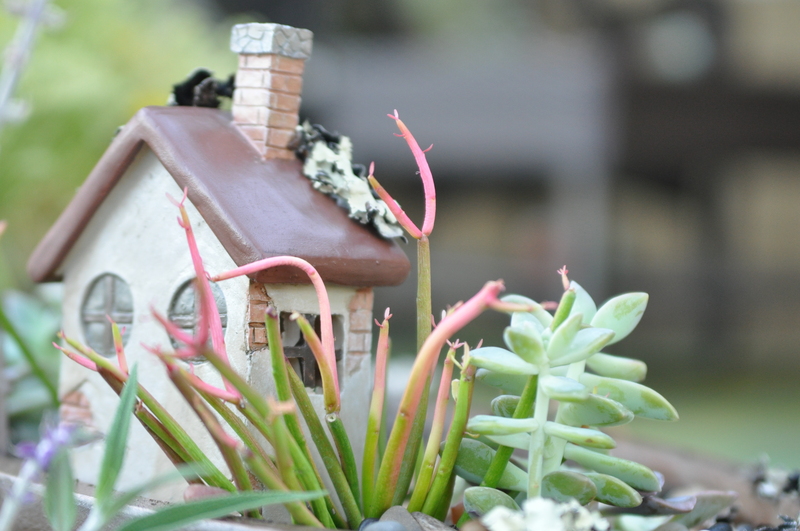 The perfect spot for the newly renovated fairy house. 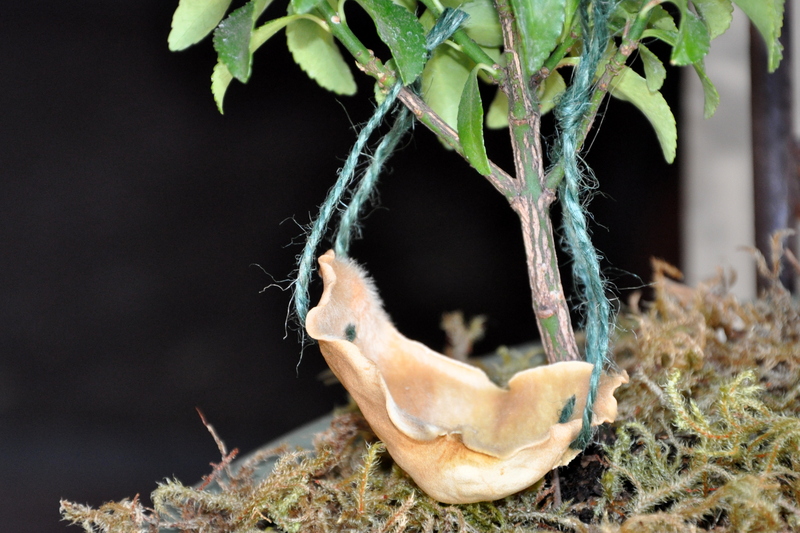 Fairies can cozy up in a Magnolia petal hammock. A log bridge connects the house and the garden. My son painted the ceramic plate, the focal point of the reading garden. The chair, lantern and glazing ball are gifts from Alyster the Gnome. There are already signs of visitors: a tiny deer behind the house, an open copy of Fairy News and the faintest movement from the wishing pond. Ahhhh…. So if you give a friend a gift card…well, you know the rest.